Can Plantar Fasciitis Socks Help Relieve Heel Pain? oes a shooting pain run up your heel or arch whenever you get out of bed in the morning? If so, you might have plantar fasciitis — an inflammation of the tissue that connects your heels to your toes (a.k.a. the plantar fascia). Plantar fasciitis usually decreases as you get up and move more, but it may recur during the day if you rise from sitting or spend a lot of time standing on your feet, making it a common complaint among nurses. In this article, we’ll briefly explain the causes of plantar fasciitis before diving into various at-home remedies, from plantar fasciitis socks to foot-strengthening exercises. Repeatedly putting stress on or tearing your plantar fascia can cause it to become inflamed and painful. Usually plantar fasciitis isn’t due to one exact cause, but several factors do make it more likely, including age and obesity. Plantar fasciitis can also be caused by being flat-footed, having a high arch or even having an abnormal pattern of walking, which can change how weight is distributed and put extra stress on the plantar fascia. Exercise that puts a lot of stress and pounding on the heel, such as long-distance running or high-impact aerobics, can also irritate the heel tissue. Most importantly for nurses, walking or standing on hard surfaces for long hours — pretty much a requirement of being a nurse — can damage the plantar fascia and cause pain and inflammation. Make sure the shoes don’t have a tall heel but do have plenty of arch support and shock absorbency. 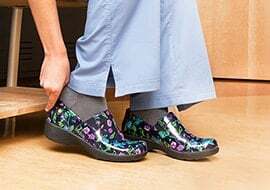 Nursing shoes and clogs are specifically designed to cushion the foot during long shifts, making them an excellent choice of footwear. If your shoes are old or worn out, invest in a new pair to make sure that your feet are getting enough support. Shoe inserts go by many names — including insoles, arch supports, footbeds and orthotic inserts — but they all do the same thing: provide extra cushion and support for your heel. You can get the inserts custom made or buy them over-the-counter. Make sure to choose a firm insert with good arch support. Coupled with the right pair of supportive shoes, plantar fasciitis socks can improve circulation, stretch the plantar fascia, and provide additional support for your foot. Compression socks aren’t a cure-all, but they are an important component of maintaining healthy, pain-free feet, especially for nurses who are walking and standing all day. Athletic tape can also be used to stabilize your heel and keep you from moving it in a stressful way. If athletic tape isn’t comfortable for you to wear during long shifts, you can still try it during exercise and other activities that impact the heel. Icing your plantar fascia can help reduce inflammation and, therefore, pain. When you get home from a long shift, grab an ice pack, wrap it in a towel — so the ice won’t stick to your skin — and apply it to the bottom of your foot. You can also try soaking your feet in an ice bath for a few minutes. Massaging the bottom of your foot can help ease pain, as can stretches that target the plantar fascia, Achilles tendon and calf muscles. If you have trouble reaching your feet, a plantar fasciitis roller can help you stretch out the bottom of your foot. If you’re really in pain, you can take a pain reliever such as ibuprofen (Advil, Motrin IB, others) or naproxen sodium (Aleve). These medications will temporarily reduce inflammation and decrease pain. While they won’t permanently reduce your plantar fasciitis, they can help you get through a long shift if your heel and arches are flaring up. If you try these methods and your heel or arch pain won’t go away after several months, you should see a doctor about it. 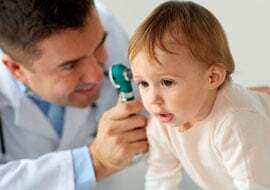 Medical treatment options include physical therapy, night splints and surgery. Long shifts can be tough on your feet and causes plantar fasciitis, but simple at-home remedies can often make a big difference over time. In fact, many of these methods — such as wearing supportive shoes and compression socks — can reduce the chances that you’ll develop plantar fasciitis in the first place. As a nurse, you’re on your feet all day, so be sure to take good care of your body so you can keep taking good care of others.